I’m not a real fan of poetry but after getting the chance to read some of Lesley’s prose I was prompted to get a copy of her book. I am aware of what Free Verse is but one cannot get the thought out of one’s head of poems that rhyme on every other line. This is not always the case and it added to my enjoyment. Lesley Worthington was Australian born, and raised in Canada. An empty-nester, she lives near Toronto with her husband who was her high school sweetheart. Earning a B.Sc. at U. of Toronto, and LL.B at Osgoode Hall Law School, she worked 20+ years as a Regulatory Manager at a Medical Device Co. She retired last year after her youngest went off to university, wanting to take writing more seriously. An avid reader she was never really obsessed with writing until three years ago. That’s when she discovered, Natalie Goldberg (Writing Down the Bones), Anne Lamott (Bird by Bird), and Julia Cameron (The Artist’s Way) it was then she knew she had the itch to write. Frozen by uncertainty on which priority to undertake, memoir, fiction, humor, she started small by learning how to write a blog and building a website. You can discover a lot more on Lesley’s website. She also signed up for Instagram using the name, worthywrites, but was unsure how to make a photo medium work for her; doing little snippets of poetry seemed the ideal way to proceed. She also can be found on Twitter at @worthywrites. Writing a book of her poetry became obvious, but how to proceed? Another instagrammer announced an upcoming book so she checked out his feed on Instagram and suddenly it became clear. If this person can do it so could she. Lesley’s poetry is not only crammed with insight but can’t help but be motivational to any writer no matter what level they rate themselves. Some poems are short, no more than three lines; others are several lines long but may only have one or two words per line. Her prose is not only motivational but I suspect is self-motivational as well. One poem begets another and so on. Each chapter takes you on a journey: from getting started, to tapping into your own inner poet for ideas, staying motivated to additional reading for inspiration; all of which I suspect is a reflection of Lesley’s own journey of discovery. 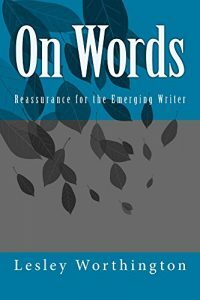 Whether you are a writer or an avid reader On Words: Reassurance for the Emerging Writer should be on your reading list. Welcome to the Author Platform of VJ Miller, Sr.